As you may have noticed, posting has been really light around here for the past couple of months as I have been in the final stages of planning my wedding. We officially became Mr. and Mrs. Lin Workman on October 29. While we had a traditional ceremony, we couldn’t resist throwing in geek touches, especially since we met thanks to a Star Wars message board and a bad Wampa joke. Lin designed and sculpted our “wedding cake” topper. 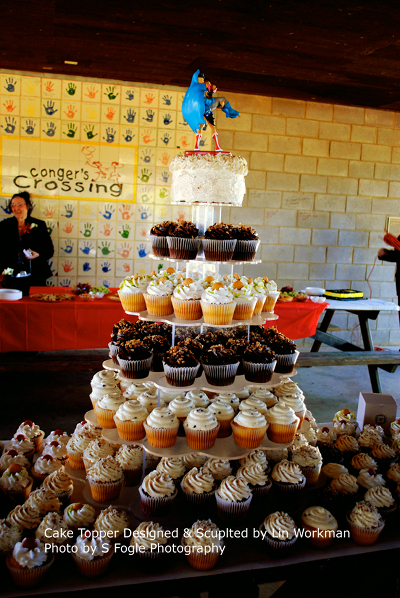 We opted for cupcakes instead of the traditional wedding cake, but the cupcakes were arranged in tiers similar to a cake. Our baker even provided us with a 6″ cake for the topper to rest on. 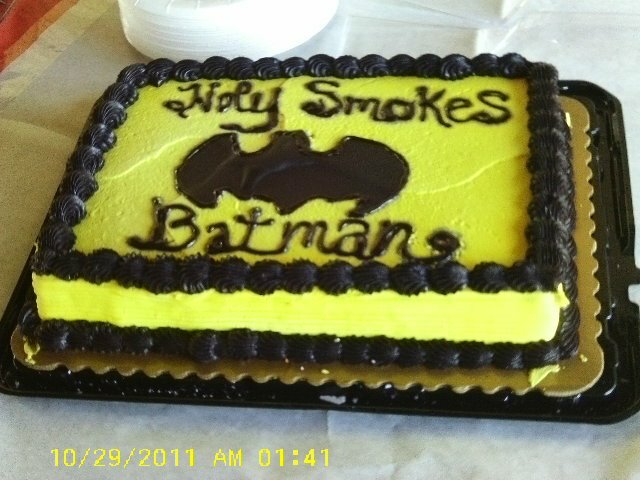 Early in the wedding planning, Lin joked that we should have Batman and Batgirl as our cake topper. I don’t like the idea of Bruce and Barbara paired romantically, and as much as I love Barbara Gordon, my first and truest superhero love is Wonder Woman. I told Lin that the topper had to be Wonder Woman carrying Batman over the threshold. At first he thought I was joking, but he became really excited when he realized that I was serious. The line art that Lin created for the cake topper was also used on our programs and our invitations. Lin has posted a series of pictures showing how a few strands of wire became our cake topper on his website. Lin really wanted me to walk down the aisle to a harp version of the Imperial March from The Empire Strikes Back, but I thought that wouldn’t fit with the traditional ceremony (and I didn’t want to be murdered at the altar by my mother). As a compromise, we played the Throne Room music from Star Wars immediately after we walked back down the aisle as Mr. and Mrs. Workman. The grooms cake couldn’t have anything else but the Bat Symbol.